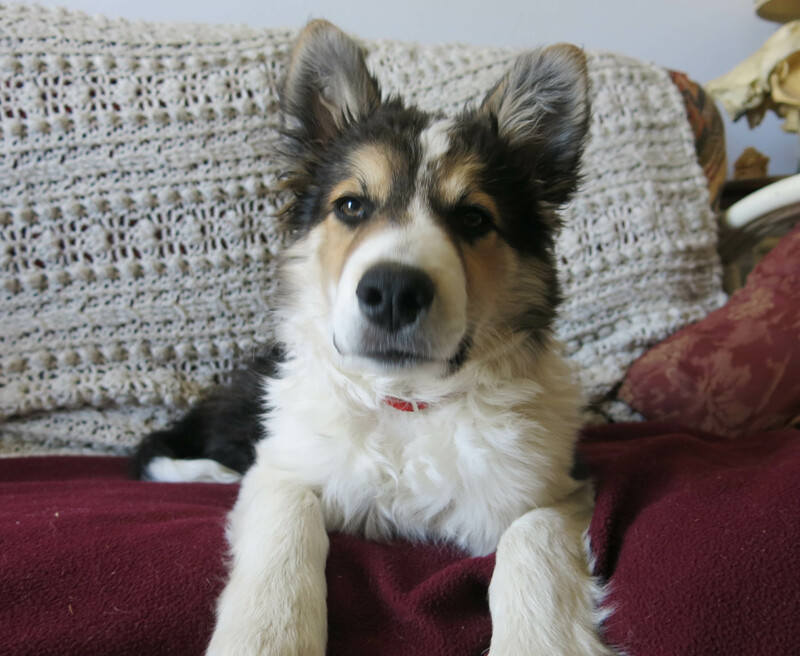 Greetings and salutations, everyone; yes, indeed, once again it is I, Mani the tiny, yet getting huger by the hour, purebred border collie, filling in for the guy I live with, and here to tell you all about my life the past few days. You may remember me from such posts as “A Misty Day”, among at least a few others. Here I am in a characteristic pose. According to the guy I live with, who’s been pretty unreasonable lately, I’ve been naughty, and am “in the doghouse”. I don’t know what that means, since I already have a house, and I’m in it a lot, like right now in that picture, as you can see. The wind came up a little, yesterday evening, and it was pretty scary. The guy I live with said it was “just the wind”, and explained that things that move do so because of the wind. I wasn’t really convinced, and had to spend some time in the kitchen, being super-aware of stuff. And since the downstairs has now been opened, so I can go down and explore, there are some issues over which stuffed animals I get to grab, and which ones I don’t. I guess that one Christmas, the guy I live with bought one of these, I think they’re called “Snuggly Bear”, for his friend who’s no longer here, and she bought one for him at the same time, so they’ve been sitting at the head of the bed ever since, and of course I grabbed one, and the guy I live with didn’t say anything, but just put it back where it was. 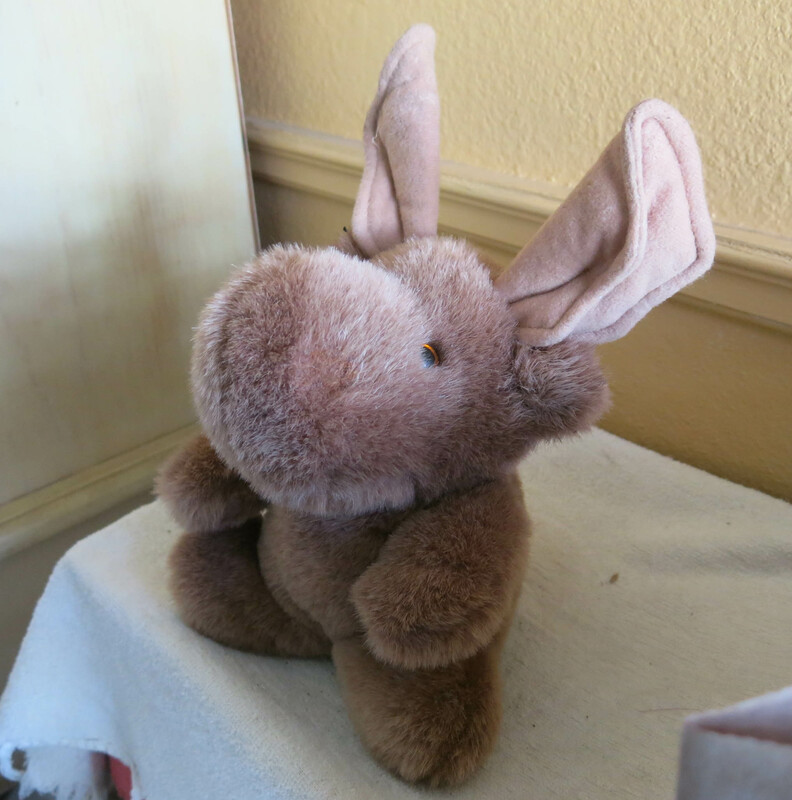 I swiped the little moose that the guy I live with brought home from Canada, as a present, and he took that away from me, too. I’m not even allowed to think about Norris (but I do anyway), who sits on a shelf in the linen closet, which has no doors on it, so I can see him looking down at me. Looking down at me kind of pompously, if you ask me, like, “I’m up here and you aren’t”, that sort of thing. Of course right now he’s looking straight ahead, because he’s so special he had to have his picture taken, looking all haughty and untouchable. Well, so what. One day I’ll be huge, and just be standing around pretending to be doing nothing, and then I’ll leap up and grab Norris and carry him out to the garden, where he’ll get all dirty, and the guy I live with will have to go out and rescue him, and that’ll be a lot of fun. Or maybe, just maybe, I’ll get to sleep with him, all soft and serious-looking, next to me, when I’m big enough to sleep in the real bed. In the mean time, I’ve been able to get some shoes from downstairs, because that’s allowed, and those are a lot of fun to chew on. The guy I live with says they’re better than chewing on him, and, while I’m not totally sure that’s true, the shoes are pretty enjoyable, especially out in the garden. I’ll leave you with a picture of me doing just that. Even tho I’m a “cat person”, can’t wait for the next episode. Um, I’m super in trouble right now; I can tell by the look he gives me, so maybe I better lie low for a while. I hear Chile is nice at this time of year…. Wow, the garden looks lovely and green. That happened fast! You must be helping, right? At my house, we voted, and we’d like your updates to happen a little more often. If you updated us more often, you’d be too tired to steal tags and everyone would be happy. And those plush animals? They look like dog toys of the finer sort to us. Do they squeak? Thanks; yes, I heard that more updates were desired, and it was all the guy I live with’s fault. As usual. He hurt his knee really badly, before I got here, and it’s been hurting more than usual. He’s old. So now he’s moaning and groaning all the time. He can walk, but like when he tries to take a nap on the couch, and them I jump up on top of him and maybe chomp him a couple of times, he complains about his knee. Those are stuffed animals. They don’t have squeakers. You want to know something? 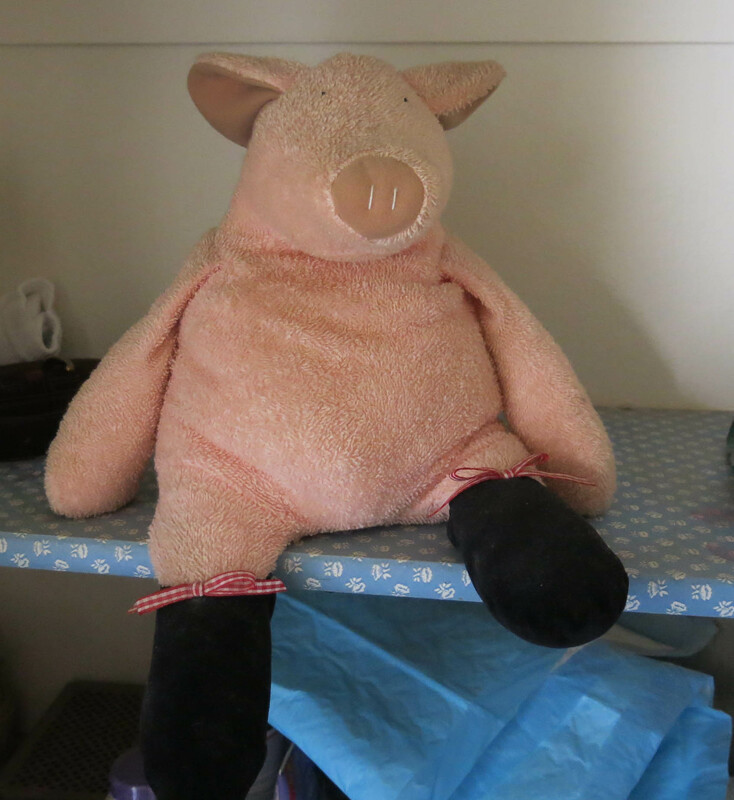 The guy I live with said I could tell, so long as nobody told anybody else, but he bought Norris because he thought Norris was a “cute stuffed pig”. What a sap, huh. Apparently he and his friend who’s no longer here were out shopping, and he said Norris was cute, and she said he was too, but that she didn’t really want him, but he bought Norris anyway. Norris just sits there, where he sits. I guess like you would if you were a stuffed pig with no place to go. I don’t know, but the guy I live with says we’ll be showing a double feature, maybe tomorrow, of me being a naughty goofball, just to show everyone what the guy I live with has to “endure”. If you can believe that. I of course have to endure a lot. I got yelled at when I started digging holes in the garden again, this evening, but I was sure I saw signs that said “okay to dig here”. I got biscuits later anyway, and a “chew deal”. And even a cuddle or two. It’s a mystery. You ask me, Norris is just waiting for his chance at places to go, and according to your plans you’ll soon accommodate him. And if you further ask me, Norris’ serious has nothing on Mani serious. Outside of your super-innocent look, serious is mostly what you’ve got, especially while guarding or on the super alert. Is life so harsh with all the looks you’re given? Can you flash us a smile? You get in trouble for totally appropriate stuff too. Is The Guy unable to discern a dog toy when he sees one? Perhaps he wouldn’t know a dog toy if one came up and bit him on his … knee. 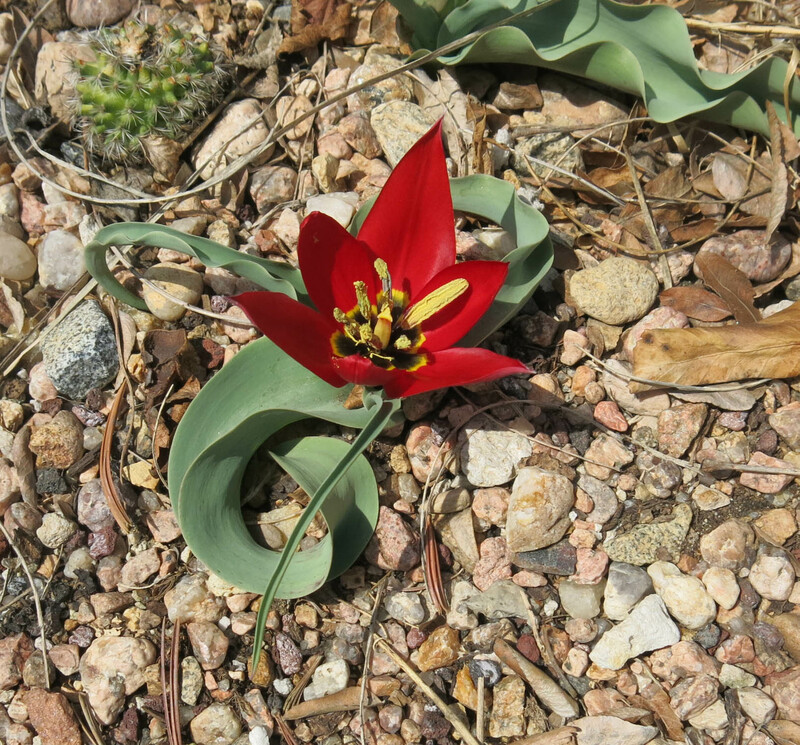 The knee must be why there are so few formal garden pics, although that is a really radiant tulip you show us. I do appreciate this time of the year in your garden, Mani. 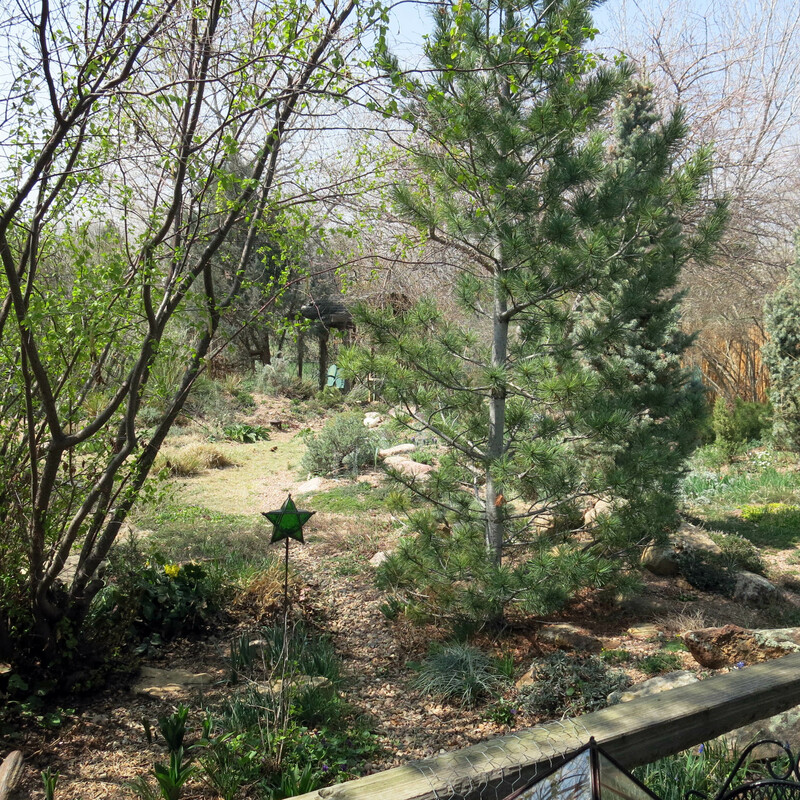 The view shots make the garden look laid out and shaped and planted with care and thought. If you finally, finally ask me, Mani, I’d say: Keep up your good work, tiny-growing-huge dog. Thanks; I completely agree that I should be allowed to play with the stuffed animals, even though the guy I live with says I already have enough toys. I don’t think there can be such a thing. 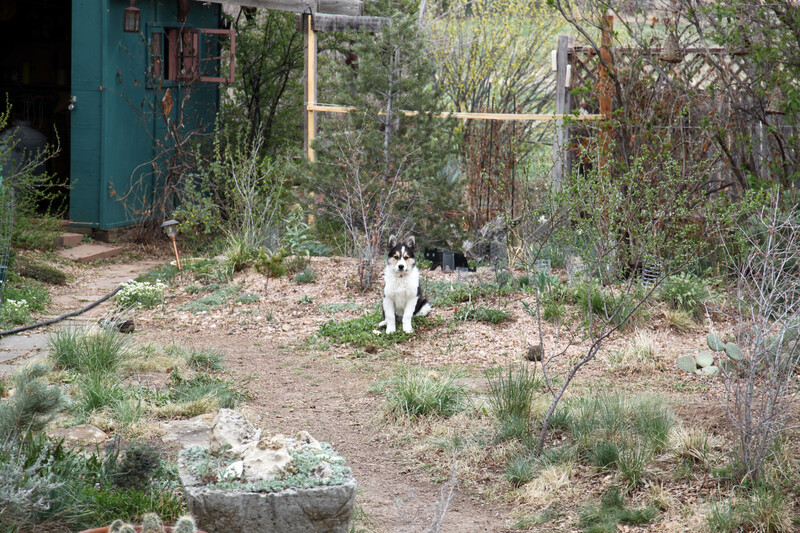 The garden mostly looks like it does in the pictures, and if you embiggen the last picture of me you’ll see a red tulip behind me, but that’s Tulipa montana, or so I hear. I also understand that there are a couple of movies which will be shown at a future date which (a) show me “being a goofball” and (b) show more of the garden. Oh My, you are getting big. You’re just like a toddler who sees every toy and says “Mine!” at the top of your voice. Thanks; yes, I am getting huge. Or, the garden is getting smaller. I have a lot of toys; most of them were here when I arrived, but some are new. Old shoes are as good as new toys, sometimes. Totally endearing … as always. Many thanks. Thanks; one of my aims is to be endearing. You know, to make up for the naughty stuff. 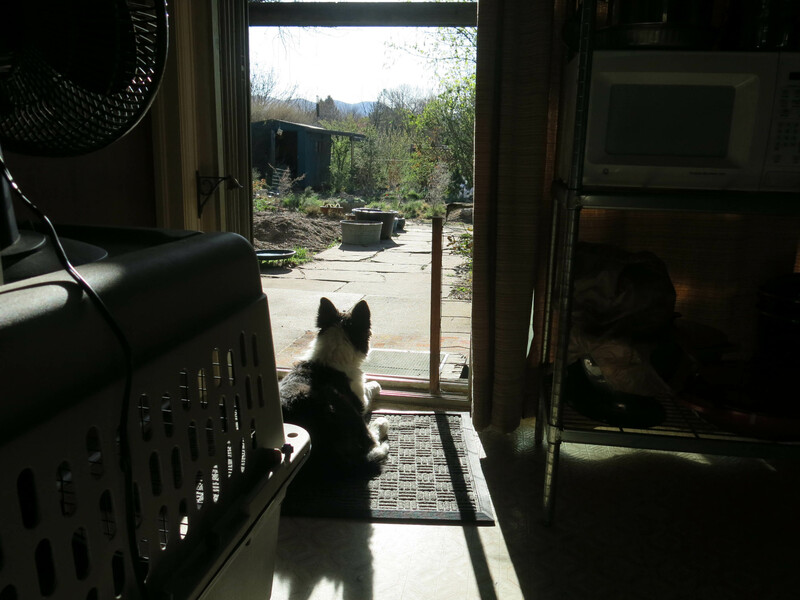 I embiggened the 4th picture of you, Mani, in which you are guarding Things What Need Guarding, including yourself. I’m sure it was taken the instant before you chomped the black cat that was sneaking up behind you. 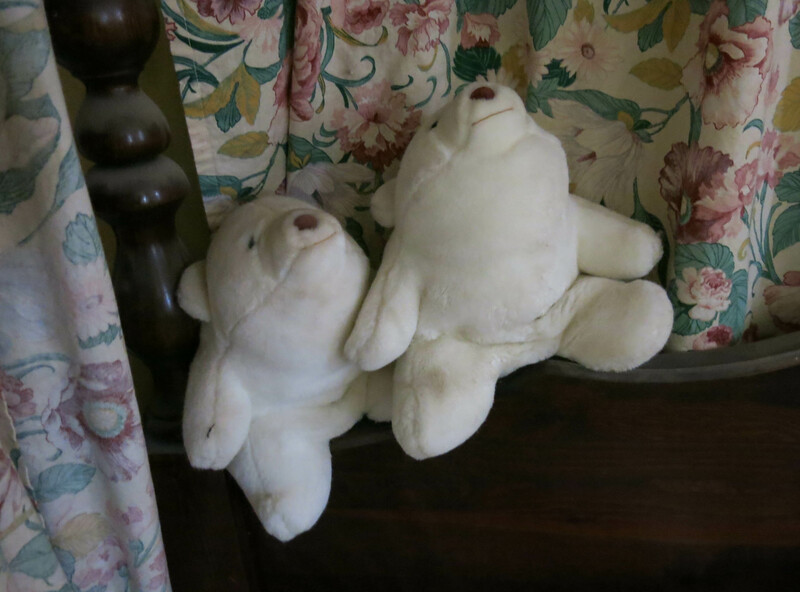 And the story about the two “Snuggly Bears” is so sweet, like a happy-ending O. Henry story. 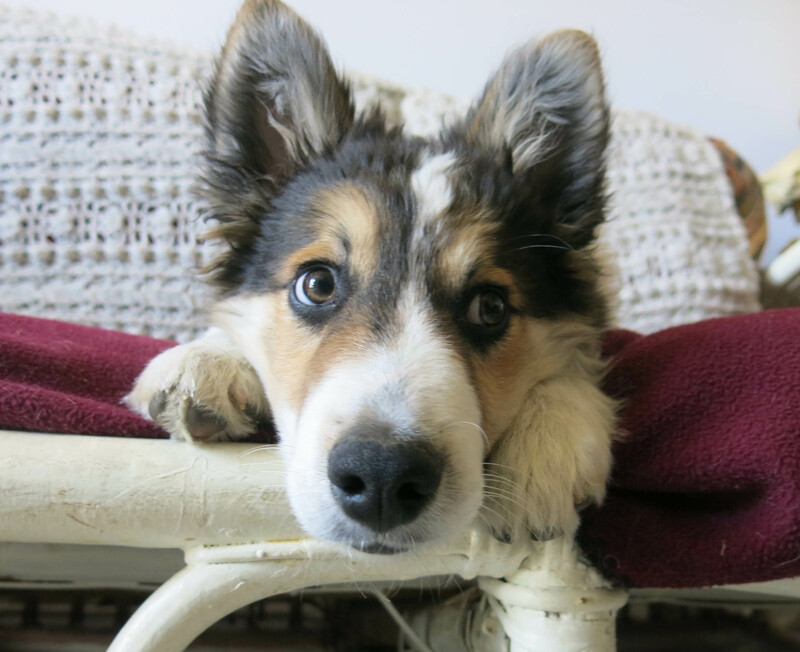 And it’s an obvious thing to say, but I’ll say it anyway, that tiny pure bred border collies would look extra-extra adorable as a stuffed toy, all ears and paws and innocent eyes, and never ever naughty. Thanks; “never ever naughty” will be my motto. I know I’m not really going to get the snuggly bears as chew toys, but the guy I live with knew they were down there, and knew I’d find them, so he just puts the one I select back in its place, and tells me to find something else. Rawhide chews are actually the best thing, if you didn’t know. The recipe here is to soak them in warm water for a while, so they’re soft, and totally excellent. Sorry about your guy’s sore knee. That can really make a human grumpy. Especially when there is lots of gardening to be done. Thanks; he hurt it pretty badly, but I guess not so badly that he’ll go to the doctor for it. Partly sciatica, partly a pulled ligament, and he read online that for the latter they don’t do anything for that, and for sciatica, which he had really bad once, the doctor said “Just don’t move”, which he was able to do pretty well. He says it’s getting better, in that it doesn’t hurt constantly. 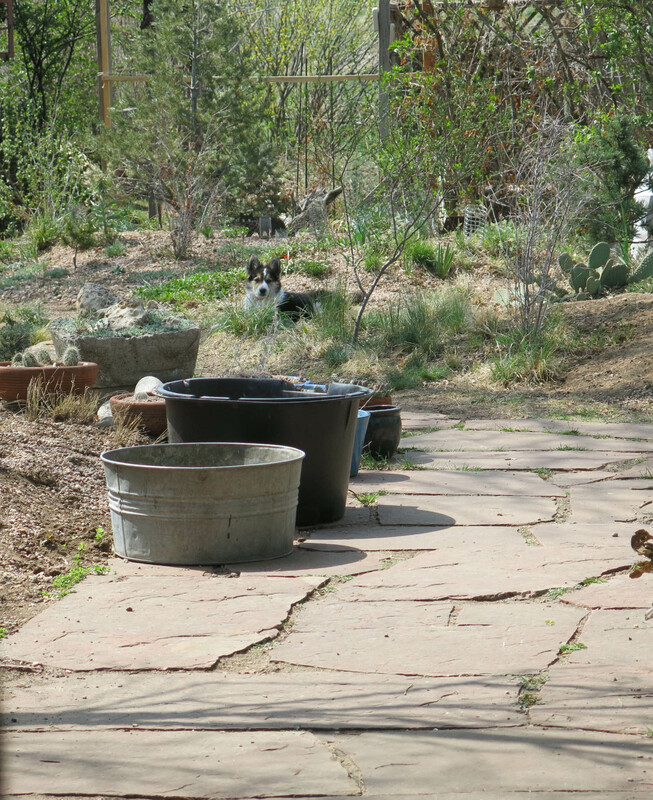 Now, technically, there is a lot of gardening to be done, in the form of weeding, but the guy I live with said that one way to weed, and I’m supposed to say that you read it here first, is simply to ignore the weeds. I will remember that weeding method. Also I empathize with not going to the doctor. The weeding method isn’t patented or anything. But, see, with the knee, he can just point to it, and the weeds. And then start whining, of course.